Last March I wrote a comment on the proposal to build a suburb, Thompson, next to the Murrumbidgee River. In that comment I congratulated the Government for consulting the community in the contemplative stage of a decision. This was a rare thing to happen and it emergence should be noted and celebrated. But a dozy proposal is always a dozy proposal. Building a suburb so close to and encroaching on a nature reserve, in this case the Murrumbidgee River Corridor, in environmental vandalism rampant. And it was called thus by conservation groups and the community at large. Incidentally, it received approval from the Housing Industry Association and tacit and qualified support from the then Tuggeranong Community Council. I wasn’t surprised to see the HIA support. Self-interest always wins out! But any support from a council purporting to represent the community of Tuggeranong should never happened. The proposal created a backlash not seen in Tuggeranong since the suggestion that we have a motor sports facility opposite the Rose Cottage Inn! Even though this was not a Government proposal, the Government was still blamed for the emergence of the proposal and a citizen-led uprising ensued. The same happened when there was a thought bubble in about 1999 or 2000 to build townhouses right to the edge of Lake Tuggeranong at west Greenway. You’d a thought lessons were there to be learnt wouldn’t you. 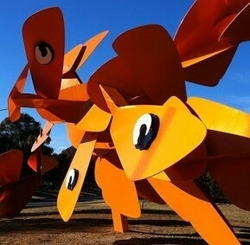 The new suburb proposal was fought vehemently by concerned Tuggeranongites, and saw a social media campaign and an on-line petition brought to bear. What part about an uprising don’t the planners get? So the Government, through the planners and the Minister fronted a public meeting and were bashed up badly.About this time, I would have realized that maybe, just maybe, it was a bad idea. But faces needed saving! It was about then I would have recommended someone taking the shovel from the proponents because the hole just got bigger. The day before the election it was put in the media that it looks like the proposal is dead! This is about seven months too late to ameliorate the damage to the Government’s chances of re-election. I celebrate the death of the proposal; it should never have been put on the table. I asked whether it was a thought canvassed in the contemplative stage and if ok with the community it would proceed or was it a brain snap? Or maybe the Government said to the bureaucracy, “Hey, we need a big announcement for Tuggeranong cos they are feeling left out” and this was the result. Either way, it was a dumb move. Or perhaps there are some bureaucrats who wanted to stick it up the Government and embarrass their minister and this was a good way to do it. Wouldn’t be the first time this has happened. I don’t know who Thompson was who has done so much for Canberra that we can celebrate that service by almost naming a suburb after him/her but I don’t reckon the family of said luminary would be much impressed about now. My advice following the death of this debacle is for all concerned with its birth is to have a really good look at how it could have been prevented by talking to a few community leaders before the proposal was put to the community at large. This quite clearly did not happen. The most significant community leader who would have given sage advice is Blind Freddy. 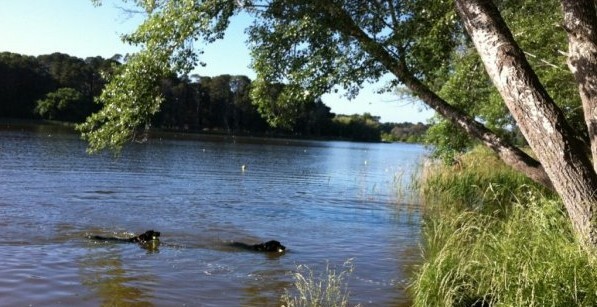 Pictured are dogs swimming in the Murrumbidgee River. So you’re saying we need to spread out Canberra even more? Have you considered how people are going to get to their place of work? More roads? I highly doubt you’ll be able to answer these questions, but I’m open to answers. As for you claiming that the Greens and environmentalists will block any move to expand Tuggeranong, that’s simply not true. They just don’t want our environment to be vandalised, and if you read the online Government consultation, you would have seen that most of the comments opposed the development and wanted the area to stay as it is and not be trashed by a badly thought out housing plan. Canberra will eventually fill up. The way you and others harp on about getting to work, you would think there were 2,000,000 people here already – not 380,000. They will do what everyone else does, use public transport, cycle, walk, car share, get taxis/Uber and of course – drive. Of course the Greens & environmentalists will block any move to expand Tuggers – you have already done that and use of terms like “they just don’t want our environment to be vandalised”, proves the point. Going by your logic, all expansion of development into Gunners and Molonglo should be immediately stopped too ’cause “how are those people going to get to work”. Tuggeranong needs to expand into Thompson or elsewhere – if only to put up more ugly high rises. No doubt the greens/environmentalists will find the endangered blind, legless, toothless, wingless bumble bee moth where ever it is proposed that Tuggeranong expand into. Thompson should go ahead. Any effects on the river should be able to be mitigated through effective planning. The Tuggeranong Town Centre (the place with two time zones) needs support and the nearby proposed Thompson development would help. But I would draw the line there. The (ugly) medium density apartments are now invading the other parts of the town centre but the shops are still empty. Fortunately, there are some large Federal agencies in Tuggers and this balances out the traffic flows morning and evening. I rather like it the way it is. I certainly don’t want to see it descend into a pop-up hipster type vista like Canberra City has become. I would not be surprised to see the incoming, everGreen Labor government drop heaps of public housing on us in the new term. It would be a win-win for them as the die-hard Liberal voters would be punished and more Labor voters would be migrated here. It’s a difficult tight rope that this development has to cross. Tuggeranong absolutely has to have some new development somewhere in the area to stop it socially and economically sliding off the cliff. Canberra is slowly creating its own Western Sydney in Tuggers and it will be harder to fix the situation the further it goes. Unemployment has doubled in Kambah since 2008, NAPLAN School performances are at an all time low, NEWSTART payment numbers have increased by 20% and mortgage default in the area is at record levels. Some housing or Infrastructure investment to attract young families to the Tuggeranong area must happen to ensure a balanced lifecycle for the suburbs. But where is there the room to build a new suburb in Tuggeranong? Look on Google maps and you will see housing butts up hard against Nature Reserve almost everywhere except the proposed Thomson development or below Banks in the very far South. The Environmental concerns were always an interesting one and I guess you need a truly independent expert to validate it. The New development at Coombs is much closer to the Molonglo River than the Thompson suburb was to the Murrumbidgee (and the both rivers join each other). The Murrumbidgee further downstream has lots of Towns, Farms and new Development built or being built right up to it’s river banks so it seems strange to me that the Thompson development was sold as the issue to cause so much damage, when all the other issues and development for the river seem to be ignored. In Short, I think the proposed Thompson development is rightly a no go. But something will have to be done development wise to ensure Tuggeranong remains a good place for young people and young families (not just a good place for recent retirees with good pensions and their house paid off). Give it a rest, eh? We still pay the high rates/land taxes everyone else does. Some of us have actually self-funded our retirement wheras thousands of ACT public servants have only unfunded superannuation. Those ACT public servants have funded their own retirements in the same way you claim to have. It’s the government who specifically didn’t fund them at the time, nothing to do with the individual workers. I am talking about the old defined benefit schemes which were non-contributory. You are right, they weren’t funded at the time so what guarantee is there that the “workers” will get what they believe is their entitlement? Yes like you, I will be a self funded retiree through a non government job when I get to retire. But these comments are not about you or me. It was about us Tuggers residents “not thinking just about ourselves” and working on creating a viable community for everyone. My comments were about the changing demographic mix of Tuggeranong and the effect that will have on Government services and Infrastructure. We need a mix of jobs, services, education institutions and infrastructure to encourage young middle class families and newlyweds to move to Tuggeranong. We need new services etc to support ageing residents as well. If you think Tuggeranong doesn’t need new housing developments, improved schools and more jobs (because they are of no direct benefit to you) then fair enough. But I disagree. My comment should not be viewed as Tuggeranong bashing, but really Tuggeranong has never really prospered. Few things have led to this IMO. Firstly being a double hop from the city to the major government work place, mostly Barton and the Russell areas. Secondly a good deal of the population being relatively close to Woden so makes going there for the wider services easier. Thirdly town centre built off to the side. This development would be no more environmentally damaging than plenty of other suburbs currently being rolled out. As for a “community uprising”, this is falling for the logic of assuming community groups and other self interested bodies are actually representative of the wider Tuggeranong community at large. This isn’t a proper and thorough planning assessment, it’s the government throwing up a thought bubble and that thought bubble being rejected by a few outspoken individuals and groups. Or maybe the Government said to the bureaucracy, “Hey, we need a big announcement for Tuggeranong cos they are feeling left out” and this was the result. Either way, it was a dumb move. I feel that way about a lot of the policies put forward for Tuggeranong. The Liberals hospital idea was ridiculous, and surely not asked for by anyone actually living in Tuggeranong – even from the deepest depths of the valley, it’s not far to TCH, and the walk-in centre at the town centre is pretty good for less urgent issues. I think this is a similar theme to the other day’s poll – not many of the Brindabella candidates live in the electorate, so they’ve missed what the unintended consequences of their policies are, and the general community sentiment.